Welcome to the Cassini/MAPS Workshop 2010 website, hosted by the CIAS at the Meudon Observatory, France. - Registration is open until friday, March 12th, 2010. - Accommodation. Lists of hotels are provided. in Meudon, and in Paris where convenient access to Meudon exists. - Access and maps. How to come to the Observatory and CIAS, local maps. - Program. Will be updated according to the submission of presentations, and finalized after the registrations are closed. 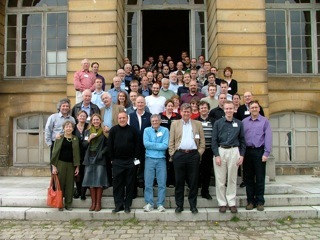 The Organizing Comittee is pleased to welcome you the MAPS Workshop 2010 at the Meudon Observatory. The workshop will be the opportunity to discuss recent results on all aspects of Saturn's magnetospheric dynamics, as well as long term perspectives offered by the extension of the Cassini tour to 2017. Baptiste Cecconi [Head] (LESIA, Meudon, FR), Nicolas André (CESR, Toulouse, FR), Laurent Lamy (Imperial College, London, UK), Philippe Zarka (LESIA-CNRS, Meudon, FR), Tamas Gombosi (Cassini/MAPS-IDS, Univ. Michigan, USA), Michel Blanc (Cassini/MAPS-IDS, CESR, Toulouse; currently at Ecole Polytechnique, Palaiseau, FR), Nicole Letourneur [Secretary] (LESIA, Meudon, FR), Renaud Romagnan [Web form] (LESIA, Meudon, FR).